Did you start scrapbooking with dreams of rows of finished albums? Is the reality more like a cupboard of unfinished objects (UFOs)? In Finish what you Start I help you learn how you can actually finish a project, and get the results you want by focussing on what motivates you in your scrapbooking. Rescue half-finished projects by repurposing or finishing them with rediscovered motivation. Have fun and get the project done! Join me for plenty of inspiration for your next project, or that little extra kick to get those UFOs done! I'm so thrilled to be teaching at True Scrap, and know it is well worth the price you pay to get in no matter what kind of memory keeper, scrapper, crafter or photographer you are! Join me for the most awesome scrapbooking event EVER! I'm so excited to share with you that I've been invited to teach a class at True Scrap 3! On April 20-21, fifteen instructors will share high-def video classes with you, live, in our state-of-the-art webroom. By signing up for True Scrap 3, you’ll receive access to our state-of-the-art webroom where you can hobnob with the rich and famous (okay, the not-so-rich and kind of famous!) and hundreds of other fanatical papercrafters, just like you! Join the True Scrap “Early Notification” Email list here: Sign up today! True Scrap: Interviews Coming Soon! Stay tuned - starting March 1 you'll hear more! On April 20-21, fifteen instructors will share high-definition video classes with you, live, in our state-of-the-art webroom. By signing up for True Scrap 3, you’ll receive access to our state-of-the-art webroom where you can join hundred of other scrapbookers, crafters and artists, just like you! 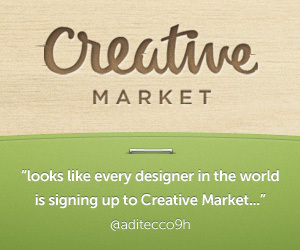 COLOURLovers is launching Creative Market soon, and I'm excited! Billed as the Etsy for mouse-made goods, this will be a market place for brushes, graphics, fonts, icons and more. I just wanted to share with you some of the layouts I've been creating this month as part of LOAD 212. In the last 10 days I've mostly just scraped in with my layout going up around midnight PST, but I'm thrilled I'm keeping up. I've attempted to finish a few different projects I'm working on and have settled on finishing my December Daily for 2011. I've used my Simple Template Album set nearly every day! I'm loving how quickly my December Daily album is coming together by using the templates and a small range of kits, including those from Flergs and Karen Lewis Designz - past class sponsors for my Perth Scrapbooking classes. Plus I've dipped into my Digi Files stash. Photoshop Elements for 50% off only! Photoshop Elements 10 is on sale for 50 percent off! So for around $50 you can enjoy text on a path, quick photo fixes, masking and more. Want to learn more about PSE10? Check out my Photoshop Elements 10 Review here. This sale ends 14th of February so jump on it now! PS If you buy using my links you’ll be helping support this blog and the free webinars I provide! This month I’ve gone for a day in the life approach again for my Take 12 – though I’ve seen some awesome themed paged around – I may have to try that for next month. I’m excited to be part of the Biz Camps 101 class coming up this week and just wanted to share this class with you. If you are building an business in the creative space I know you’ll be inspired by Jennifer’s actionable steps to building a business with happy, loyal customers. Jennifer knows her stuff, and is the owner of Simple Scrapper. Biz Camp 101 demystifies the online tools and approaches today’s small businesses need to know and lays out exactly how to attract and build relationships with the creative consumer. For just $89 today, you’ll receive the Biz Camp 101 course material, bonus business-building lessons, unlimited email access to me during the course and the ongoing, lifetime support of your Biz Camp peers in our forum. I’d be thrilled to see you inside! Have you heard about Bite-Sized Scrapbooking? It's a system that breaks down the process of creating a layout into three distinct steps, and guides you to work on one step at a time so you won't waste time, get side-tracked, or feel overwhelmed. 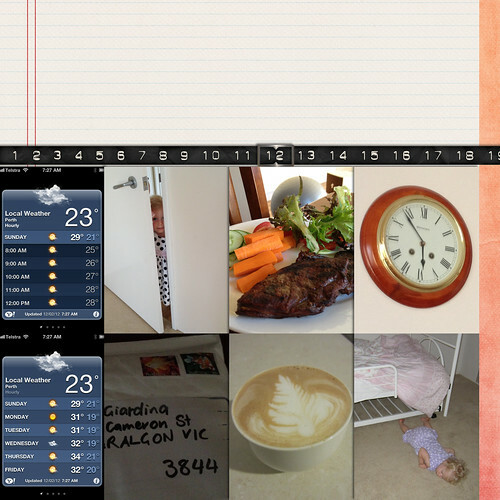 It's also a fun way to create layouts—paper or digital! Kim Byrns has just compiled 6 more months of scrapbooking inspiration into bundles - each one with six months worth of inspiration! Kim is generously offering a copy of BSS Bundle #2 to one lucky reader! BSS Bundles offer you a self-paced version of Bite-sized Scrapbooking with 52 layouts in total (26 in each bundle). Use them to get layouts done on your own schedule, or prepare for a crop -- you'll be the most productive scrapper there! for cardstock, papers, journaling blocks, etc. Just leave a comment below and let me know how you like your scrapbooking inspiration? What inspires you? What is the source that gets you scrapping more? I'll draw the random winner on the 20th February at 8pm EST. I'm finishing a few albums and having a ball with over 400 scrapbookers! Want to see what I've been working on? I've written about my Day One of Layout a Day here. I'm also doing my photoshoot and video for True Scrap this week - exciting stuff! Are You Wearing Red Today? Go visit Ella today to learn more about Wear Red day and be entered to win this awesome prize! True Scrap 3 - Sneak Peek and BIG NEWS! Wondering if True Scrap is for you? Check out the recordings of the previous True Scrap events. You can sample classes from Spawn of True Scrap for only $9.99! Featuring Cathy Zielske, Noell Hyman, Renee Pearson and 14 more! Welcome to to my stop on the One Little Word blog hop for February. If you’ve come from Karen’s blog, welcome! The full list of blogs is at the end of this post. After completing a hybrid album last year, I’ve decided to stick to my usual digital pages this year. I just love the slim finish of photobooks, so I’ll just print my book out as a soft cover photobook at the end of the year. In the mean time I’m using this page as my January cover and photo of myself. To keep it in plain view, I’ve also made this page my desktop background. 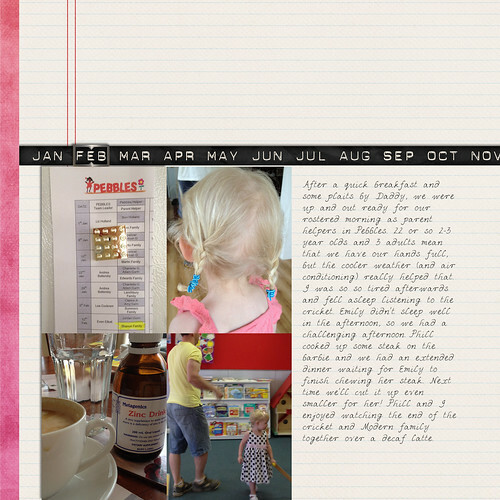 If you’d like to see how I created this layout check out my latest Digital Scrapbooking Workshop. Ali Edwards sends out monthly emails with a prompt for the month and you just complete it as you are inspired to throughout the month. Did you know that the One Little Word class is open all year? Melissa S http://blog.mshanhun.com – YOU ARE HERE! Thanks again to Margie for organising this hop!